LIFE IN THE DOG HOUSE tells the inspiring life stories of Danny Robertshaw and Ron Danta and the remarkable work they do at Danny & Ron's Rescue. Ten years and 10,000 dogs later, their unique approach to life and dog rescue will capture hearts and inspire millions to make the right choices when it comes to man's best friend. This DVD includes 5.1 surround sound, stereo and English subtitles for the deaf and hearing-impaired. Over 12,000 combined followers on social media including Facebook and Instagram! The filmmaker is donating all of his net proceeds from the film to dogs rescue charities around the country! A MUST-SEE documentary for dog and animal lovers! An excellent new documentary film. 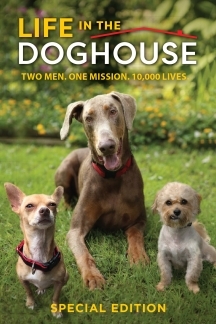 If you're a dog lover and especially if you've had any experience with rescue animals, Life in the Doghouse will be a really worthwhile viewing experience, though have your tissues handy for some of the more emotional moments.